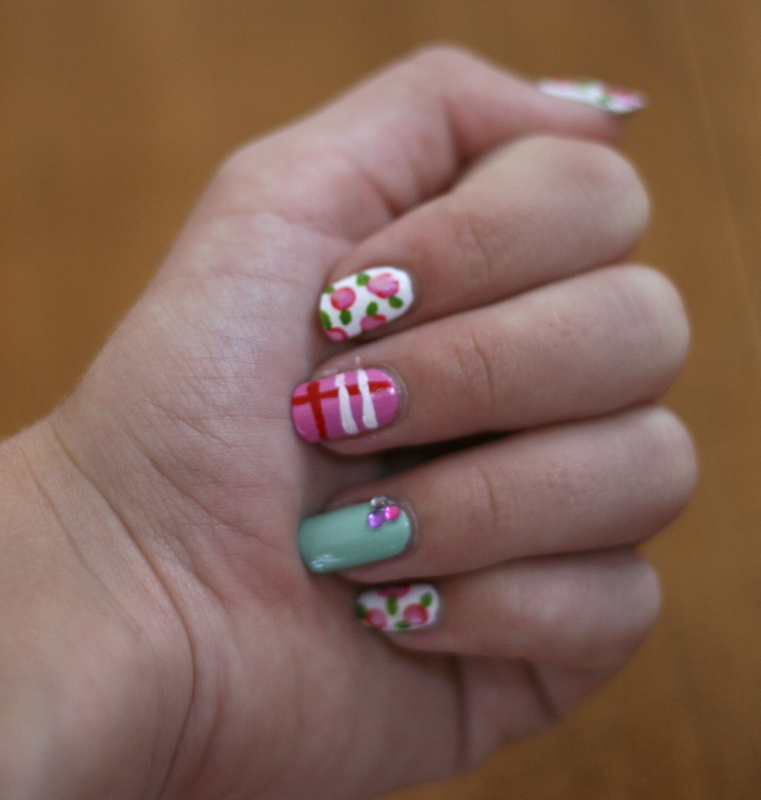 Today I have another nail art inspired by a post on Pinterest! This is super easy (even for beginners!) and I hope you try this out! It’s a simple pale manicure with some glitter and silver gems for a glamorous touch. Let’s get started! The original picture from Pinterest is at the bottom of this blog post. Credits to the owner! First, paint your nails a pale, pink color until opaque. This may take two or three coats! After the polish had dried, take a striper and some gold glitter polish. Create curved lines coming from the top of your nail, ending at the bottom! Mine turned out more straight, so feel free to experiment and make funky, curved glittery lines! Next, apply some silver nail art gems anywhere on the gold glitter line. Place the gem near the top or bottom or even in the middle of the line! Apply a shining top coat and you’re finished! Let me know if you recreate these nails and be sure to share it on your blog! If you’re new to this blog and don’t know who Jasper is… click here to find out! I first painted my nails two coats of a dark green. I really love this shade because it’s so pretty! After letting the polish dry, I took a dotting tool and some white polish and began to apply the polka dots carefully on my ring finger. Make sure that the dots aren’t too close together! After you’re finished with the polka dots, take the same dotting tool and start to create a heart on your thumb. Take your time with this! It’s okay if it doesn’t look perfect. After everything has dried, apply a top coat and you are finished! 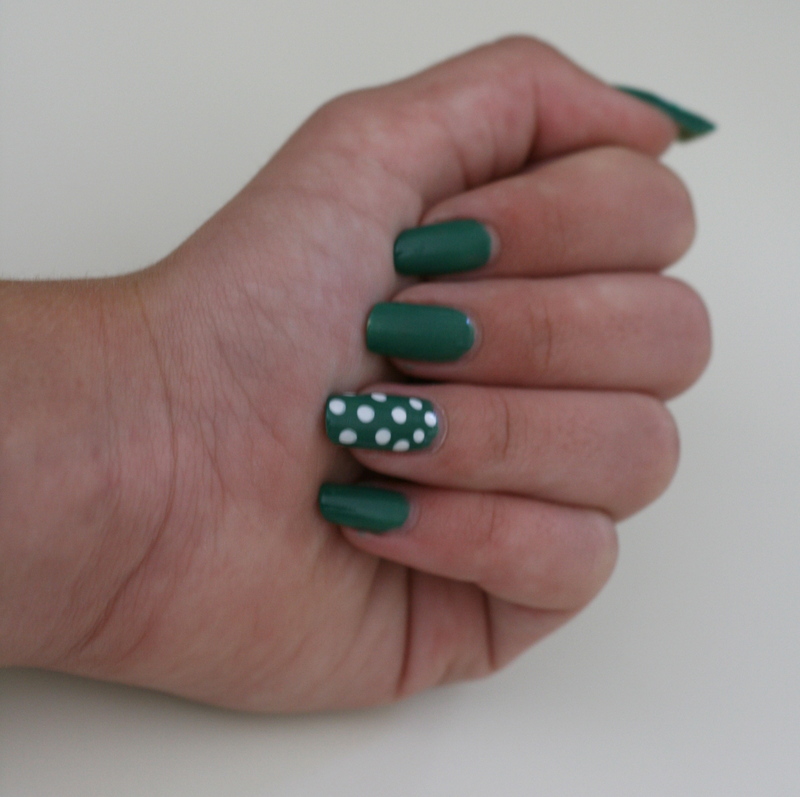 I like how the white stands out against the green and I will definitely try more polka dot nail art soon! If you have the right tools, this will be very easy nail art! If you’re wondering, I received my dotting tool in a set with other nail brushes from Amazon. I use the other brushes for touching up my nails or for creating French manicures. I hope you enjoyed and I’ll see you next time!